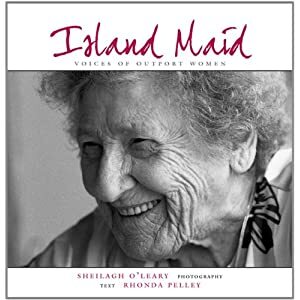 I have just finished reading Island Maid: Voices of Outport Women, by Sheilagh O'Leary and Rhonda Pelley. I won this at the Book Mineset blog for the August update to the 5th Canadian Book Challenge. This is not like any book I've ever read before. I fully admit that when I choose books, I tend toward time travel romance historical fiction. I do have a few biographies in my library, but they are always books completely about one person, not just snapshots in many people's lives. To me, anthologies scream budget-conscious university course material. Is that ignorant? Probably. But I have changed my mind! This does somewhat bring back memories of uni but in a good way. This is like an oral history (herstory?) that I wish I had read in anthropology. The authors went around the outposts of Newfoundland meeting with women elders in small towns and villages. They bring us snapshots from women's lives as well as from their journey. I am left with such a profound feeling of accomplishment from all of these women. They have worked the land and the sea, birthed children, raised families, entertained and created, built communities, fed and clothed their loved ones and neighbours, and did it without husbands, sometimes forever and sometimes for months. They have lived in harsh conditions and still their power has not waned even into old age. These are the stories of contributions women made to the building of Newfoundland and Labrador before it joined the Canadian Confederation in 1949. But it reflects the stories of women all over Canada and even the world. I read the stories of these women and I understand them, but I see other women as well. I see my grandmother making rasberry wine on the porch like Phyllis O'Leary. I see the fish strung up to dry and it reminds me of the fish lines strung up in winter by my neighbour after her husband comes home from a particularly good catch. I see my mom planting and tending her carrots and peas and potatoes and sewing up clothes just like Flora Whitt. And sometimes I see myself, in the stories of mothers rushing home after their office jobs to tend their houses and in their worries about the economy and ecology. The photography really makes the book. O'Leary shot all the photos without a flash, just natural light, and this gives the photos a genuine feel that blends with Pelley's text seemlessly. I love that Pelley and O'Leary were able to capture moments in time and memories of women that are so very representative of their tiny areas and their time last century, but also represent women's work so well. This was my 9th book for the 5th Canadian Book Challenge. This book does sound amazing though - I love reading about real people's lives, that's what makes history interesting for me, the first person accounts. I love to be inspired by strong women too, and it sounds like this is a book full of them. You've hit the nail on the head, that is totally what makes history come alive. Another time travel romance fan who will admit it?? A kindred spirit you are! These women are the kind of heroes our children should be looking up to and inspired by ... just put it on hold at the library, great review! Sounds great, so glad you enjoyed it! you actually did make me curious. Wanda, I totally agree. I'd like to see stories like this of the hardworking elders who built our societies in many other places as well. Different places all over Canada and the world. John-thanks so much for the opportunity to read this book! Bigger- if you want to read it, let me know! @ Medea - yes, I am definitely interested.